Glass bowl with colored glass granules, decorative and unique in design and color scheme for soothing eyecatchers in your apartment. 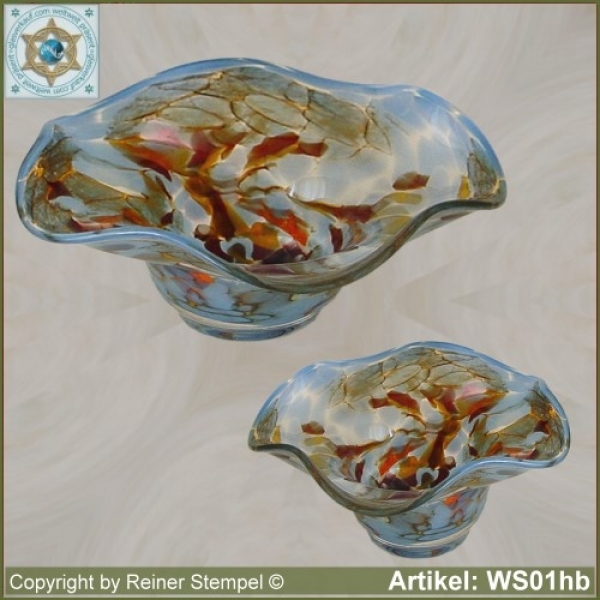 This glass bowl are each through their manual production, a real unique. From the liquid glass- melt, at approx 1150°C takes the glassmaker with the so-called glassmaker- pipe, something glass and rolling this into colored glass granules. After applying from the colored glass granules, shall with a needle in transverse direction drawn a pattern. Thus prepared, the hot glass is with the glassmaker-pipe through simultaneous forms and blow an Cylinder and then by very rapid rotation and braking, the so-called slingshot- technology in this bowl-shape, worked. This glass articles are in front the glass furnace freehand - so without form - blown. Therefore one speaks of free-form glass. Then must the glass bowl in the so-called cooling oven and shall at 520°C overnight cooled slowly to room temperature. This is necessary to compensate for material stresses. High manual skills, a good sense of proportion and years of experience with the glass material are the basic prerequisite for the production of our high-quality glass articles. Unbreakable packaging send we our high-quality glass ware to our customers around the world.